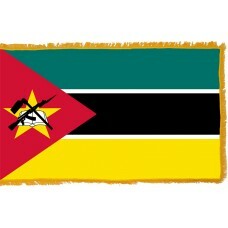 The Mozambique Flag features three horizontal bands in the colors of green, black, and yellow. The black band in the middle is bordered by a thin white stripe. To the left of the flag, is a red triangle pointing to the center of the flag and it features a yellow 5-pointed star that has an AK-47 rifle with the bayonet attached to it crossed by a hoe on top of an open book. 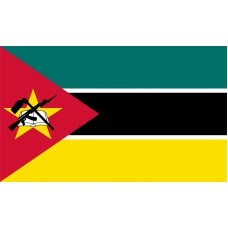 The diagram of the rifle crossed over the hoe on the open book is part of Mozambique's coat of arms. The green color on the Mozambique flag represents the country’s agriculture and greenery. The black color represents the African continent and the yellow color represents the minerals of Mozambique. 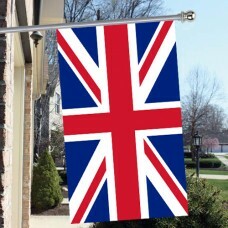 The thin white stripe border is a symbol of peace. The color red represents the struggles and battles fought for independence. The rifle is symbolic of the country's "defense and vigilance" and the hoe is a symbol of Mozambique's agriculture. The open book represents the importance of education and the star is symbolic of Marxism and Internationalism. The Mozambique flag was adopted on May 1st, 1983 and is based on the flag of FRELIMO (The Front for the Liberation of Mozambique). This was the organization that started the country's protest for independence. 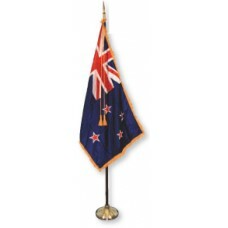 The flag was almost the same, except it did not feature the country's coat of arms on it. The Mozambique flag is the only flag in the world that has an illustration of a modern weapon, and there is still a debate today that surrounds it as many people feel that it signifies and encourages violence and war and would prefer that the weapon was removed from it. Mozambique is located in Southeastern Africa that shares borders with Tanzania, Malawi, Zambia, Zimbabwe, Swaziland, South Africa, and the Indian Ocean. The capital city and largest city is called Maputa. Mozambique is considered to be one of the poorest countries in the world, yet tourism is gradually increasing as it is home to many beautiful sites that are on the UNESCO world heritage list, such as "The Island Of Mozambique" which is the most popular tourist destination and is a city famous for its history as it used to be a Portuguese trading-post as well as being famous for its beaches. Another popular attraction is the "Chapel of Nossa Senhora De Baluarte" which is a chapel that was built in 1522 by the Portuguese and is one of the oldest European buildings. Mozambique is also home to the "Gorongosa National Park" which is thought of as "The place where Noah parked his ark" and often referred to as "Serengeti of the South." Gorongosa literally translates as "Place of Danger" and the park used to be home to a wide variation of dangerous animals, which included, elephants, buffalos, and lions. During the war, the majority of the wildlife in this park, was lost. In 1505, Mozambique became a Portuguese colony. The Portuguese had limited control on Mozambique until 1891, when Africa was divided by the Europeans. In 1961, Mozambique, became part of the Portuguese Colonial War when FRELIMO began campaigning for independence, joining the conflict that the Portuguese already had with Angola and Portuguese Guinea. The war continued until 1974 and on June 25th, 1975, Mozambique gained its independence.